Sunday afternoon, while watching the football game on TV, the munchies are going to strike. So what can a guy whip up that isn’t too technical and won’t take up much time? Instead of the usual chips and dips, there’s no reason why you can’t provide some healthy hot snacks for all your buddies! Or maybe you’re looking for a simple meal that takes just a few minutes to prepare instead. Either way, homemade Potato Skins is one way to fix potatoes and add some wonderful flavor to the mix that will satisfy your hunger — without all the preservatives and fat found in bags of potato chips! The healthiest potato is a baked potato. Since Tater Skins are baked, not fried, you still retain all the healthy goodness. These are so simple, and you don’t need a lot of time either. It doesn’t matter what kind of potatoes you use. Whatever you have on hand will work. We usually use Russet Potatoes, but for this batch we had Red Potatoes in the pantry. They worked just as well. Wash and slice some potatoes into ¼-inch thick slices. Don’t bother peeling them. After all the skin is where all the healthy vitamins are found. Coat the tin foil with some cooking spray and arrange the potato slices so that they don’t overlap. Sprinkle salt and pepper on the potato slices, followed by some finely diced onion. 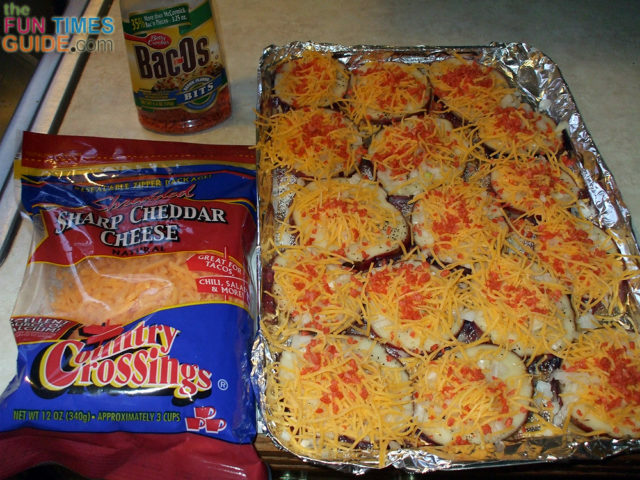 Top the potatoes with a good covering of grated cheddar cheese; then sprinkle some Bacos bacon bits on top of that. Bake in a 375-degree oven for about 30 minutes. TIP: A trick to speed up cooking time that my wife uses is to send the potato slices through the microwave for about 10 minuets before spreading them out on the cookie sheet. This cuts the baking time by at least half. Myself, I prefer to just put them straight on the cookie sheet and let the oven do its job. Now tell me, isn’t that just about the easiest snack you can make? This hot out of the oven snack features 2 favorite flavors that will keep everybody happy: cheese and bacon! It’s a tasty treat that’s good for you, too. When my wife and I want to make more of a meal from Tater Skins, we simply throw a handful of fish sticks in the oven to cook along with the potatoes. They’ll finish up about the same time — especially since we like our fish sticks on the crunchy side. My wife often includes a side order of cottage cheese, rounding out this quick and easy meal.